Typically, Vista looks at the contents of a folder and then decides what kind of template to apply to the folder. But did you know that you can tell Windows Explorer to assign a specific template to a folder in Windows Vista? In fact, you can even go so far as to edit the template and customize the information that will be visible to all folders with the same template. There are five different templates: Documents, Pictures and Videos, Music Details, Music Icons, and All Items (which you can think of as “All Other”). 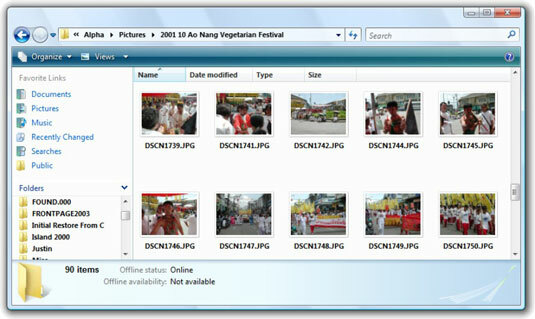 Each folder’s template determines what kind of picture appears as the folder’s icon and which details appear in Explorer’s Details view. Assigning the correct template improves your efficiency by providing you with the detailed information you need for the correct file type, but it also provides you a different set of tools on the toolbar. For example, if you open a “Pictures and Videos” folder, Explorer slaps a Slide Show button on its toolbar. Another way that you can improve your efficiency in Windows Explorer is by assigning a picture to the folder. Assigning pictures to folders allows you to visually move through folders quickly. The picture you choose appears in Extra Large Icons, Large Icons, Medium Icons, and Tiles views. Use Windows Explorer to open the folder. A folder full of photographs incorrectly assigned to the All Items template. 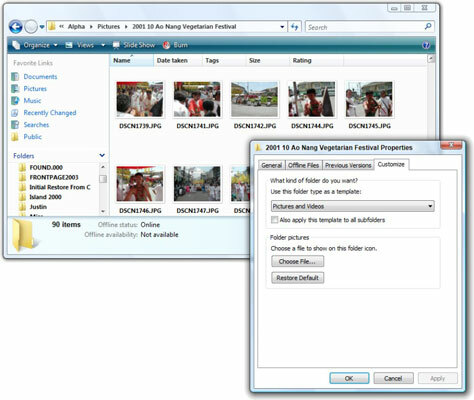 In this example you’ll notice that Vista incorrectly assigned the All Items template to a folder full of photographs. A sure way to tell there is a problem is that when you open the folder there is no Slide Show button on the toolbar. Right-click any blank area inside the folder and choose Customize This Folder. The folder’s Properties dialog box appears with the Customize tab showing. Not all folders have Customize This Folder as a right-click option. Sometimes, you can change the folder’s template by right-clicking and choosing Properties→Customize. Sometimes, for reasons known only to Microsoft, the folder’s Properties dialog box doesn’t have a Customize tab. In these cases, you’re just out of luck. Choose a template from the Use This Folder Type as a Template box. Assign the folder to the Pictures and Videos template, and suddenly the Slide Show button appears. In particular, if you want to see the Slide Show button, you must choose Pictures and Videos. The toolbar inside the folder changes immediately. If you’re in Details view, the template’s details also appear. If you want to put a picture on the folder, click Choose File and find the picture you want. The picture appears when you view the folder itself in Extra Large Icons, Large Icons, Medium Icons, or Tiles view.